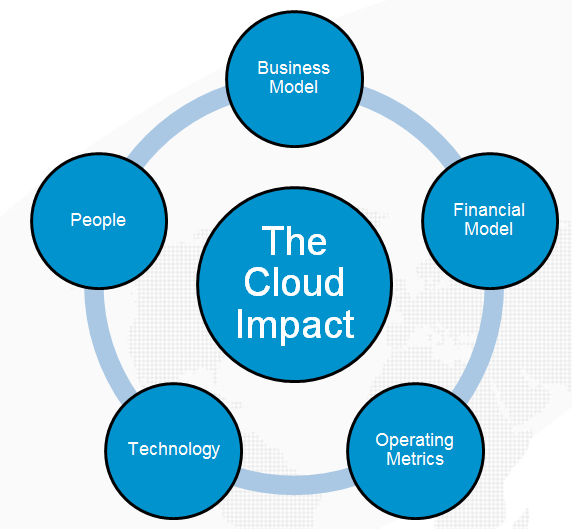 You are here: Home / Business Strategy / Business Model / An Independent Software Vendor (ISV) moving to the cloud – what are the financial implications of this? An Independent Software Vendor (ISV) moving to the cloud – what are the financial implications of this? I will start with the business model in this blog entry and continue with the others in later blog entries. The change from perpetual software license model to subscription-based model will change the way the ISV sells its solution and it will change the way the ISV structures its partner channel. It will also change the way the ISV markets its solution. The main driver for this is that the ISV will not be able to sustain its cash flow with a traditional sales model as the sales team needs to keep much higher pace in sales when moving to the cloud environment. The sales model for an ISV has to be either fully automated with customer self-service or it can be highly transactional where you can have some human elements but the amount of transactions will cover the cost of maintaining people to close the deal. The ISV has to be able to control the Customer Acquisition Costs (CAC) as that is one of the key drivers to be able to achieve break-even point and start generating pure profit. This does not typically happen in less than a year, whereby the ISV has to maintain a happy client so they sign up for a new contract period assuming that the contract period is 12 months. I will analyze the metrics in my later blog entries. This just gave you an example of the operational changes that an ISV will experience. How does an ISV manage to plan appropriate scenarios that it can take when moving to the cloud? Obviously, the assumption is that the Board of Directors have made a decision that the ISV has to make the move to survive in the new global competition where anybody from anywhere in the world can enter the competitive field. There are no geographical borders that will keep the ISV from competition. If you are an ISV from Italy, you can expect to get somebody to enter your territory from France, Germany, Brazil or Bolivia. Once the strategy has been set, you will have to use a model to operationalize your strategy and I am used and thrilled about Dr. Osterwalder’s Business Model Canvas that provides all of the needed elements to analyze and “paint the picture” on a high level. I have witnessed several experienced senior management team members to become enlightened of the power of the canvas and it really has become our number one tool when working with ISVs. 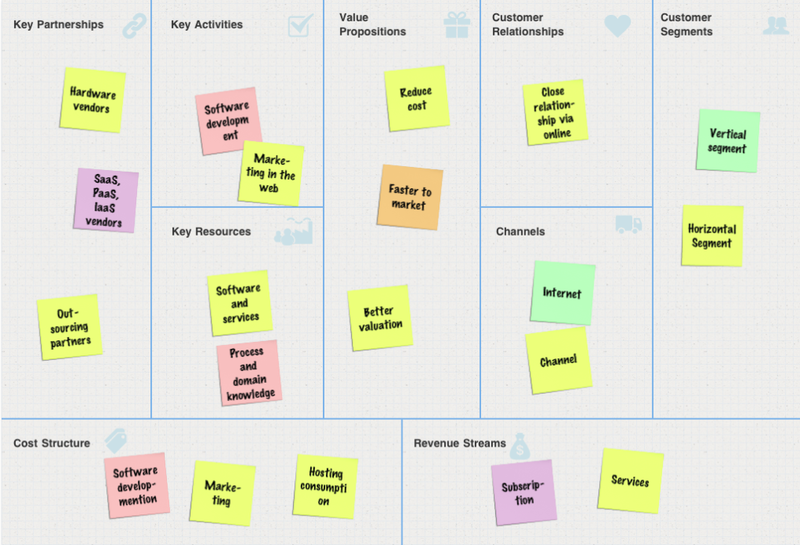 The Business Model Canvas consists of nine building blocks: Value Proposition, Customer Segmentation, Revenue Streams, Cost Structure Key Resources, Key Activities, Channels, Customer Relationships and Key Partnerships. The power of a business model framework such as Business Model Canvas is that the management is compelled to take a position on each of the nine building blocks on a Business Model Canvas. Each building block can also have its own key metrics and these can become the foundation for a dashboard that the management team tracks on the monthly basis. Besides the question whether the ISV has the right core competence to move towards a cloud business, the key question that any ISV has is how this change is going to impact the financial model and the canvas above shows how the Revenue Stream building block has to be in balance with the Cost Structure block. In the perpetual software business model the metrics on the cost structure and Revenue Streams are completely different. To summarize, the ISV and its management has many different questions to answer in its journey to the cloud. The first is to make sure that the owners, the management team and the Board of Directors have a common understanding where to go with the strategy. The role of the Business Model Canvas is to help the ISV to lay out a few possible operational scenarios that it can take in its cloud transformation. In my next blog entries I will explain in more detail the financial impact on an ISV when moving from traditional perpetual software license business to subscription-based business model. Stay tuned for more.